Muslims (meaning, who submits to the Divine) are commanded by God to pray five times a day. And to the surprise of non-muslims, all faithful muslims do that 365 days a year, everyday. Sometime non-muslims wonder, why so many times? Are these folks crazy or what? There are thousand reasons why muslims pray five times a day. I can go on with a very long list, but i would like to just mention some very common sense reasons. One from Buddhist perspective another from Christian (or you can say mystical perspective). The mystical perspective: When you are in love, don't you have this longing to call your beloved time and time again? Perhaps you wish to see or talk to him/her hundreds times if you are away from him/her. This experience is very common to all human heart who is in love. All religion teaches you to love God, the Supreme Being. And muslims don't just say that, but in action do what love demands. Thats why they hasten to their Beloved time and time again, contemplate on the Divine. That is the secret of praying numerous time a day. From mystical point of view, God is the ultimate Lover and you communicate to your Beloved by your prayer. What else son of Adam have but prayer to communicate with Him? The Buddhist perspective: Buddha taught the great importance of mindfulness. It is prayer at set times are great tool to meditate and to have a mindful life. We often are too must swept away with our materialist day to day affairs. 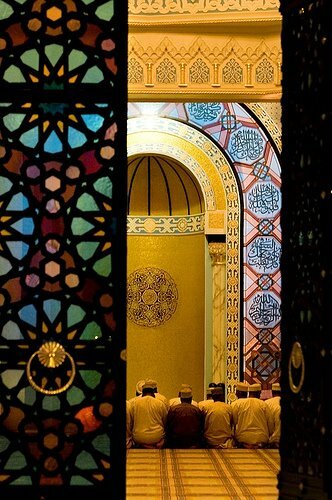 Muslims when they pray at prescribed time, they again come back to their soul, come back to their origin. It is a collective, mindful meditation that helps you not to forget who you are and where you belong. The art of mindfulness is applied very practically in regular prayer and meditation. Now you may ask, pray regularly is ok. But isn't praying five times a day is too much? The simple answer is no, its not too much. Billions of muslims on earth do that. And even when they participate in this modern lifestyle. There is a provision in Islam that you can combine your mid day prayers together and night prayers together. So, practically it come down to pray (or meditate) 3 times a day. So if you are scheduled very tight because of busy work you can pray thrice. First, before sunrise. then at the middle of the day and after sunset or at night. By doing so among other blessings what happen is that you get a clear and peaceful mind. By praying before sunrise, you start your day early. In the middle of the day you take time out to pray and you help yourself to free yourself from the work stress. By praying at end of the day you complete the cyle and cool down your stresses. Even in this twenty first century the medical and psychology experts are suggesting to take time out during work and to do regular meditation. Islam being the final message to humanity established this practice for modern man. And in Original Judaism prayer was also prescribed 3 times a day. Jesus (peace be upon him) also used to pray 3 times everyday respecting the laws. It is only Pauline Christinity that downplayed the significance of prayer. When Islam came after original message of Jesus was corrupted, Islam prescribed prayer 5 times a day but at the same time gave opportunity to observe it in 3 times. Technology of the Heart: Why muslims pray everyday?